We are always looking for new Mission Remission contributors! As a platform created by our community for our community we appreciate anything you’d be willing to share about life after cancer. Mission Remission is all about sharing ideas and experiences, because not only is writing a great therapy, it offers that warming feeling - you know you're helping others too. You are now an expert in what helps! We’ve all discovered strategies that help our body move on; our mind calm; and our soul find happiness. What could I write about? We’d love to hear your stories and tips about any topic, from returning to work or re-qualifying professionally, to dealing with social situations and relationships. We’d also love to read stories of how other organisations have helped you recover after treatment. We love frank realities, sarcastic humour, and inspirational anecdotes that share how you’ve discovered your ‘new normal’. We’re totally inclusive and would love to share perspectives from all walks of life. As a non-profit focusing on life after cancer, we try to focus primarily on the ‘after’. Rather than diagnosis and treatment, we focus on dealing with recovery and rehabilitation – the physical, psychological, and social. Therefore, we try to place the details of diagnosis and treatment in your ‘bio’ paragraph. Should I follow a particular structure? A word count of between 500-2,500 would be perfect. We’re happy for you to structure the post however you want. After you’ve emailed it through to us, we tend to add sub-headings as a guide through your words. Bio: we’d love you to share a bit about yourself at the end of your post – as much or as little as you wish. Perhaps your cancer type and what interests you more generally? Full names or pseudonyms are up to you - you could pick a brand new name for yourself if you want! Happy to link to blogs, websites, twitter accounts etc. It would also be great to share a picture or two of you, but again that is totally at your discretion. We will never change the tone of your piece, but we might discuss small changes to the order of words when we come to add sub-headings. Of course, we will *never* publish until you are happy with how your words look. We always add infographics to our features posts – made up from your words. Emily’s story is a good example. The one thing we will never do is share something that might contradict the advice of clinicians. We’re happy to share how complementary therapy helps, but we will never recommend complementary therapy as a replacement for modern medicine. If something sounds uncertain, we will always check with clinicians first. What about those on long-term chemo, or active ‘surveillance’ – do we belong here? We know many will be on active monitoring or life-long chemo – and we welcome you too. How do I submit my stories and tips? You can do so directly on the site here, or you can drop us an email to suggest a topic, or send over your finished post. Can I share previously published blogs or articles? Generally, blogs will need to be changed slightly as the tone of a blog is often quite different. 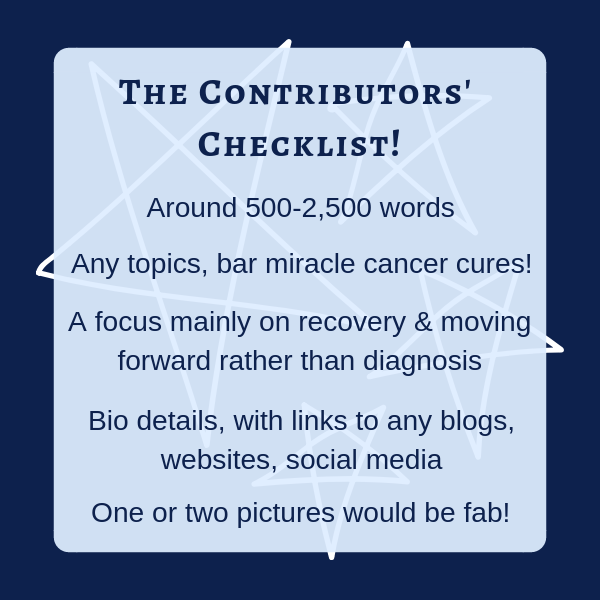 This is simply because the audience of Mission Remission are cancer survivors sharing stories and tips of life after cancer, rather than the audience of your blog, who tend to be friends and acquaintances. But feel free to send over previously written blogs and articles and we can chat about it! We try to say thank you to every post featured on Mission Remission. 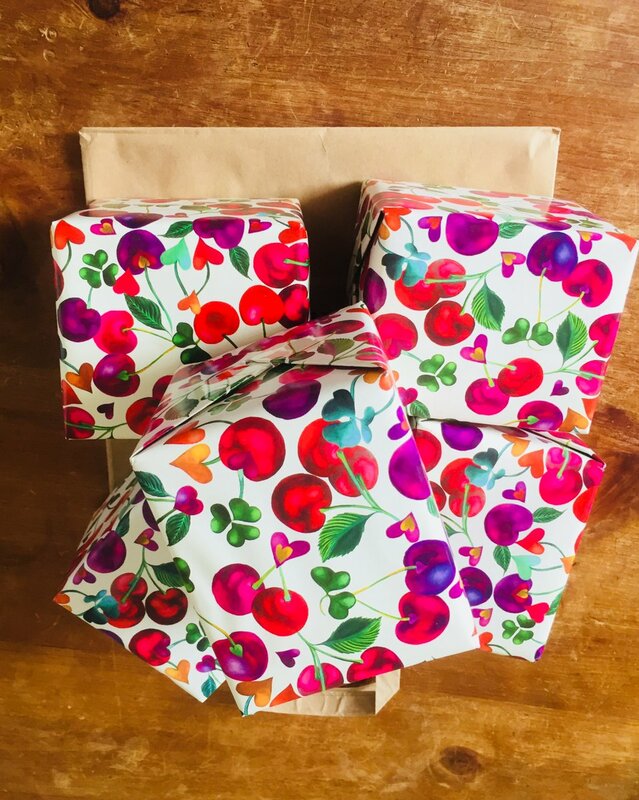 This comes in the form of Lush boxes, Headspace access, Buddy Boxes from Blurt, and other exciting gift vouchers. If you’d like more info, please drop us an email! Giving back to our community is the most important thing to us and we work hard to ensure we're all in this together.